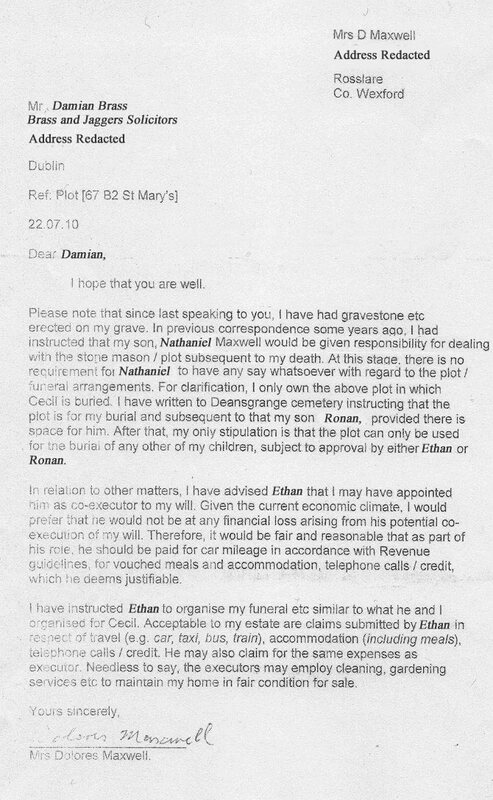 This letter to Dolores' solicitor was sent three days after the text quoted above. Ethan broadcast the text to Dolores' children six weeks before Dolores died. He dropped her clothes off to the funeral home well before this time, and gave instruction to the funeral home concerning Dolores' burial. In contrast, although Dolores' condition was very much touch and go, her consultant, hospital staff and most of her children were hopeful that sometime in the future Dolores would be able to be discharged to a nursing home. Dolores and Cecil's second son, Cecil Anthony, died on January 13, 1959 in a tragic accident. He was only 16 months old. A family gravesite was purchased at this time in Deansgrange Cemetery in Dublin, an easy walk from the family home. Dolores visited Little Cecil's grave all her life. His grave was marked very simply. As the Maxwell family increased in size, Dolores and Cecil purchased a second plot next to the first, ensuring that there was room for all the Maxwell family to be buried there. (Grave plots in Ireland routinely hold the remains of several people.) They are in St. Mary's section, numbers 67 B2 and 68 B2. Deansgrange (or Dean's Grange) Cemetery was begun in 1861 (with the first burial occurring in 1865), it consisted originally of eight acres divided into the North Section and the South Section. Entering the main gate, Catholics were buried on the right, Protestants to the left. It now contains sixteen sections spanning some 70 acres, and there are over 150,000 people buried there. Sales of plots were stopped in the 1990's due to lack of space, but resumed in the past few years in a very restricted and limited way. A single burial plot in nearby Shanganagh Cemetery at the present time costs €2,700, while a plot in Deansgrange costs €16,000. Applicants for the Deansgrange plots must be resident in the Dun Laoghaire-Rathdown County Council area, and be at least 70 years old. However, anyone who owns a plot can sell it, and transfer ownership for a fee of €80. Sold on the open market, the selling price would be expected to be higher, but even at 16k, it works out to about €500 per square foot. Dolores and Cecil had provided space for themselves and their eleven children to be buried together, and intended that they themselves would be side by side when the time came. Unknown to any family members until well after the fact, it seems Ethan had taken ownership of the unused plot in March of 2010 (it is uncertain whether Dolores was aware of Ethan taking control of the family plot; it is thought likely she wasn't). At that time the transfer fee was €75; a letter in Dolores' name and a cheque was all it took. Contrary to her intentions, Dolores had to be buried with Cecil and Little Cecil in the original plot purchased back in 1959. It also came as a complete surprise to most of Dolores' children that a headstone had been erected on the plot where Cecil and Little Cecil were buried. This occurred sometime after January 2009, the one year anniversary of Cecil's death. Dolores in many conversations with her children made clear her intention that no headstone be erected until after her death. She intended the gravestone to span both plots. It is unknown whether Dolores was aware that the current headstone was erected until after the fact. When it was first discovered that Ethan took the family plot from Dolores, it was thought the motivation was merely to spite his brothers and sisters, and deny Dolores her wishes regarding her burial. It seemed petty, even for Ethan. Upon the realisation that the empty plot was worth many thousands of euros, the real reason behind this became clear. It appears that once Ethan broke up the family plot, it was necessary that Dolores not be buried beside her husband. How could he sell a plot that wasn't empty? We expect the denial of Dolores' wishes and the spitefulness shown to her children were only additional by–products of Ethan's usual financial motivations. It seems curious that this letter fails to mention what happened to the other plot; the author doesn't mention Ethan as being the “owner,” only that the author assigns him authority over Dolores' remaining plot. At this time, there were several FOI requests in process, a process that Ethan necessarily knew about and would shortly seek Damian Brass' aid in circumventing. It is speculated that Ethan would not want his mother's solicitor to know that he had taken control of the family plot; this may have aroused even Damian Brass' sense of impropriety. That is not Dolores' voice. That Ethan, apparently for financial gain, so readily disregarded Dolores and Cecil's plans concerning the family gravesite, and denied Dolores her simple wishes for her burial is predictable and unsurprising, although saddening. It pales in comparison to something else he took away from Dolores. Dolores once stated about her husband Cecil that “...he was a difficult man to live with... ” We think anyone who knew Dolores well will recognise that statement as speaking volumes. After Cecil died, Dolores was filled with a sense of profound freedom. She expressed her hopes and desire to enjoy her life, to travel to far–off places, to do all the things she wanted. She was happy in expectation of what the future would hold for her. The sparkle in her eyes was beautiful to see. As always, we seek and encourage anyone with knowledge of Dolores' life and/or the events presented here to contribute to this site. Memories, anecdotes, photos and documents are more than welcome. Clarification, correction and alternative views are encouraged and welcomed.